So, as many of you know I'm in the midst of editing. It's why my blog is like a ghost town and my comments have been sporadic. Editing is work. I shouldn't complain though, in fact, I feel super lucky. I had a real, living and breathing agent talk to me on the phone and tell me what would make my book even better. How priceless is that? Well, (the ever brilliant and funny) Jenni James sent me this video that pretty much shows exactly what happened when I hung up the phone with the agent. In fact it's so creepily accurate that I wonder if Star Trek really does take place in the future and they were watching movie clips of my life to get this scene. I was even wearing an outfit remarkably similar to Captain Kirk's (I know, weird). I didn't touch my computer once yesterday. Not once. For those of you who know me, you'll know this is a minor miracle. And the fact that I didn't go into withdrawals is a major miracle. Why did I feel the need to do this? That's a good question. Aside from my writing/computer/internet/blog/facebook/twitter addiction, I had a dream. Yes, a dream. It was a very odd dream that made me realize that I needed a 24 hour (at the very least) break from my computer. I am walking down the street in my neighborhood and run into my blog friend Jenn. Now, since I have never met Jenn in real life, I not only have no clue what her voice sounds like, but I also have no idea what anything beyond her smiling head looks like. So that is exactly how Jenn appears in my dream--a floating picture of just her head. (Now, Jenn, I think you're gorgeous, but a floating picture of your head in my dream was just plain creepy). "Hey, Kasie." Remember, I have no idea what she sounds like, so this appears as typed written letters beside her head. Yes, her head begins to IM with me. "Oh, I was just reading Kiersten's twitter update." "See for yourself." Next to Jenn, Kiersten's head appears (once again, beautiful, but creepy). It says: Kierstenwhite is hugging Laptop. He just thought of the best idea ever. "Really? What idea was that?" I ask Kiersten because apparently her twitter is now in direct communication with me. (mind you, no one but me is actually speaking in this dream and I'm beginning to look around for some people who have actual voices). Thank goodness my good friend Candi appears in this moment. "Hi, Kasie. Did you hear about Kiersten's Laptop's idea?" She has a voice. "Uh, no, she was just about to tell me...I think." I wait to hear the idea, but Natalie and Jenni arrive in this moment with Nikki's whole family picture floating beside them. This is getting weird, I think in my dream. Time to wake up before more of my blog friend's heads appear. And thank goodness I did. So, as you can all see, I needed a break from my computer for 24 hours. Perhaps I shouldn't have shared that. Hmmm, oh well, you all already know I'm crazy. I've been thinking a lot lately about when, where, how, I ever got interested in writing in the first place. I traced it back to two specific things that happened in my life that planted the initial seed. The second experience which steered me towards writing was the creative writing class I took in high school (which led to more classes later in college). My teacher was so encouraging and always had a way of making me feel good about my stuff. At the bottom of all my stories, she'd write things like, 'This one was great, you should submit it.' At the time I had no idea just how hard it was to get things published, but it made me feel good. Because I've been thinking about this specific teacher and how much she influenced me, I decided to try to find her email address. It wasn't hard at all because she still teaches at the high school. I went to the website and it was right there. So I wrote her, told her how awesome she was, and then told her I was working on some edits for a book I was getting ready to resubmit to an agent. I asked her if she'd be interested at all in reading it. If she had time, of course. I needed someone who hadn't read my first draft and who could look at it with "fresh" eyes. She wrote me back like ten minutes later saying she had just been talking about me to another teacher that very day (huh? I graduated in '94, so weird/awesome). Anyway, to make an already lengthy post short, she told me that she would love to read my manuscript and, in fact, was very excited to do it (see, she still knows how to make me feel good). I was so stoked (bringing out the high school words). My high school creative writing teacher is going to be reading my MS next week. I wonder if she'll give me a grade. So, do you remember the specific event/person who inspired you to follow your dreams? *Dirt. Not just once, but on several occasions. I can hear it grinding between his teeth as he chews away as if eating the tastiest treat ever. *Fish food. Yes, you read that right. Fish food. Now that's seriously nasty. He opened a thing of fish food the other day and proceeded to put, not just a few flakes but, fistfuls into his mouth. And he didn't make a single gag face. I mean, this is disturbing is it not? When I was cleaning him up the smell alone almost made me puke. And then of course we have the normal things like barbie shoes, money, toy balls, toy cars, toy anything. Maybe he is training to be the future eating champion of the world. How proud I'll be when he earns that title. Okay, I have the most awesome friends ever. Seriously awesome. The amazing Jenni James has graced me with the honor of her wonderful talents by agreeing to draw my fairies for me. This is the rough draft of my spoiled princess, Sadie. Isn't she beautiful? I love her. I have never seen one of my characters brought to life. They've only ever existed in my head. 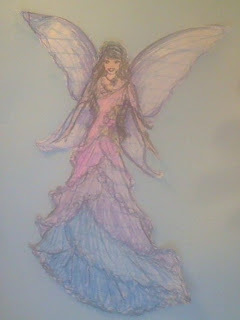 So when Jenni roughly sketched a fairy for me while I was in England, my heart was racing. And then today she emailed me this and now I'm dying. How are all you people so talented? (Yes, I'm narrowing my eyes at you, Nat) I want to be able to draw, but I don't want to have to practice. Is that possible? No? Okay, I'll just have Jenni keep drawing for me then. It's easier that way. I'm much to lazy to learn myself. And I wouldn't be able to "whip up something in ten minutes" that was this good. Ever. Never ever. So thanks, Jenni, you're the best. "Fated" blurb: When Sadie’s fate is sealed by a Teller’s prediction of her future mate, she knows her life is over. Brendan is the last person on earth she could ever love. She is not going down without a fight. Convinced that the Teller is lying to keep his position as counselor to the King, Sadie sets out to find a way to expose him so she can pursue her true destiny--Jase. I forgot to let everyone know I was going out of town. It's funny that I feel guilty about that. I feel like I need to give you all of my excuses for not telling you. Number one excuse is that I honestly thought I would post while I was on vacation. You see, back in December when I went out of town, I told you all I wouldn't be able to post while on vacation so you wouldn't be hearing from me for a week. But what did I do? I posted every day that I was gone. Then I felt like a loser who had no life and was addicted to posting so much that I had to post even on my vacation (and the truth is that I am). Anyway, I'm home. I was in England visiting my friend/coauthor, Jenni James. I had a blast and she kept me so busy that I didn't have time to post. I will tell you about my trip and post pics tomorrow. It's fun to be home and I can't wait to catch up on all your blogs. I need to speak with the owner of Costco stat. I have a little complaint. Okay, so a really big complaint, as in the really big sized shampoo/conditioner bottles they sell. Can someone require them to have a pump, please? I mean, seriously. I'm in the shower this morning (I sure do talk a lot about the shower, sorry about that) trying to get a handful of conditioner out of the larger than life bottle. And aside from the fact that it is super slippery and weighs twenty pounds, it won't come out. Now this is a fairly new bottle, it's not like I'm scraping the barrel here. I mean, it's not even close to the point where I add water, put the lid back on, and shake until I have at least 2 more uses (3 if I'm lucky). The flaw in the system is that the bottle is just too big. It needs two hands. But one hand is being held out, waiting in vain for the conditioner that the other hand is trying its hardest to squeeze out. Now let me tell you, it is important not to drop twenty pound bottles of conditioner, because they really hurt when they hit your foot (not that I know, I'm just saying). The only solution, I found out this morning, is to use one hand to smash the bottle up against your chin, and finally the blessed, tangle-reducing nectar flows into your hand. A pump would solve all my problems. I'm tired just thinking about the fact that I have to do this again tomorrow. Have I mentioned the bottle is huge? I'm going to have it for a while. I guess I'll just count it as my work out for the day and stop complaining. I think some things just aren't meant to be bought in bulk.